Two thin-necked dragons bite symmetrically into the rim of this round-bodied ewer. The object dates perhaps from the Tang dynasty. Archaeological findings show this type of ewer is often found in pairs in tombs, with some scholars speculating that they were part of 'mingqi' (funeral goods) popular from the early 7th to mid 8th centuries AD in today's Shaanxi and Henan provinces. The shape of such ewers may derive from Greek 'amphora', with Chinese potters modifying the design by adding dragon heads for the handles. 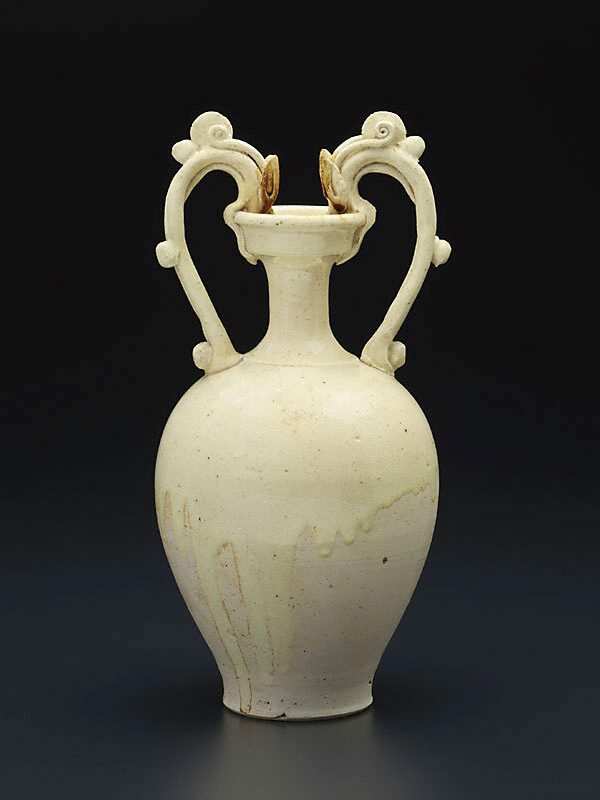 By the Ming dynasty (1368-1644), Chinese intellectuals often placed similar exotic 'amphora' in their studies, sometimes using them as ink containers. By the Qing dynasty (1644-1911) the famous Jingdezhen kiln made reproductions of such vessels, adding blue and white, and polychrome glaze. Jackie Menzies, Asian Collection Handbook, Art Gallery of New South Wales , 'Early Chinese Art', pg. 18-29, Sydney, 1990, 26 (colour illus.). See "Further Information' for text. The Asian Collections Art Gallery of New South Wales , 'Early Ceramics', Sydney, 2003, 103 (colour illus. ).